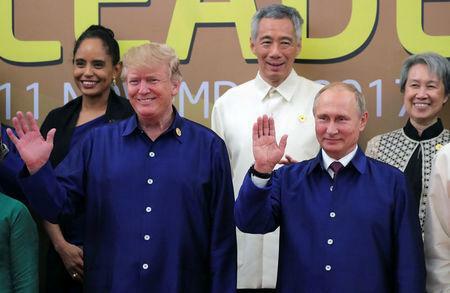 DANANG, Vietnam (Reuters) - U.S. President Donald Trump and Russia's Vladimir Putin shook hands at the Asia-Pacific Economic Cooperation (APEC) summit dinner in Vietnam on Friday, even though the White House said there would be no formal meeting. The two world leaders did briefly meet during the so-called APEC class photo, where all the heads of state come together to take a photo before the summit officially starts. Trump and Putin shook hands and had a briefly spoke before the photo was snapped.